This Baby Bunker is distinguished by a technique of sculpting and blending the craft fur and reverse tying the head. The sculpting is achieved by tying the craft fur in sparse bunches first on top, then around the hook in progressively shorter lengths and layering them to round out the body. The blending is achieved by layering different shades and colors of the sparse bunches and then combing them till they blend. Reverse tying the head gives it a rounded shape that pushes water ahead of the fly while allowing water to run through the lifelike body. The fly, then, is a modified version of the Hollow Fleye. Tail: Wings and Body: Different colors of craft fur, some shade of white for the lower half, pink or red for the gills, and some shade of chartreuse, green, or blue for the top. Tie on thread and wind down to bend. Tie a sparse bunch of white craft fur on top of the hook to create a platform. The length of this bunch will determine the length of the fly. Tie several more sparse bunches of white, tan, pink or other light colors, now spreading the craft fur around the shank and adding some more to the sides to begin a round shape. Comb-blend fur together after each layer. Add more sparse bunches the same way, though some may be darker, moving up to the last third of the hook. Continue to comb-blend each new layer. Tie in 6-8 strands of flash, varying the lengths. Tie one short sparse bunch of pink or red craft fur on each side for the gills. Tie in one or two more sparse bunch of darker craft fur. 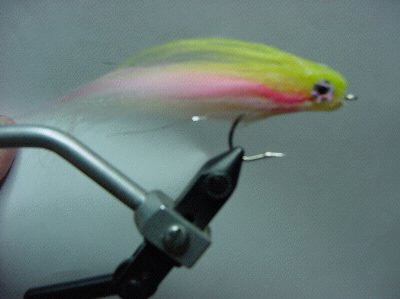 Turn hook over and tie on a bunch of belly-colored craft fur. Be sure to leave about 1/4 inch for the head. Turn hook back and reverse tie a thicker bunch of dark craft fur around the top half of the hook. Turn hook and reverse tie a thicker bunch of belly-colored craft fur around the bottom half of the hook. Gently pull both the top and bottom bunches back, and then push forward gently to shape a rounded head. Hold the shape with one hand. With the other hand, bring thread through the craft fur to the eye of the hook and whip finish. Comb fly to blend, continuing to shape the fly. Add a small amount of Softex to the head, work it through the craft fur, and gently push to keep the shape for a minute or two till the Softex sets enough to hold it.